Prague is one of the most beautiful cities in Europe. 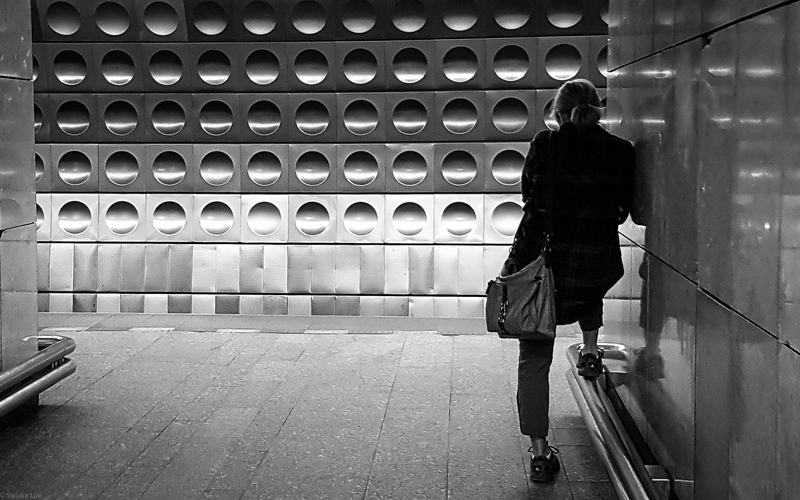 While the bridges and old city buildings are gorgeous, I am most intrigued by the subway stations. 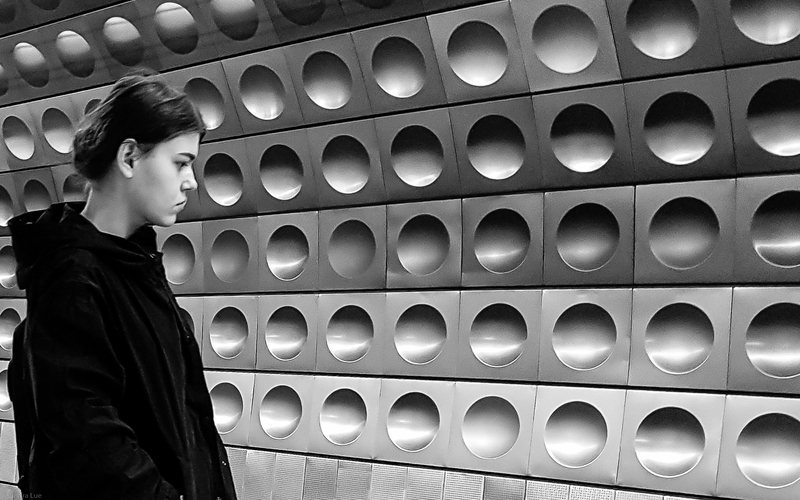 The station designs are clinical, severe and strangely melancholy. 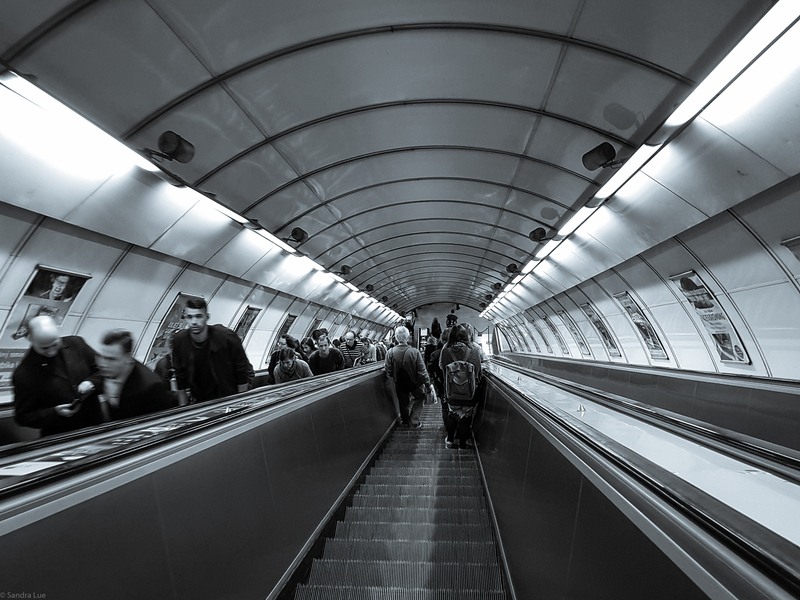 It is no surprise that the Prague Metro is relatively new, only forty five years old and almost entirely Russian built. 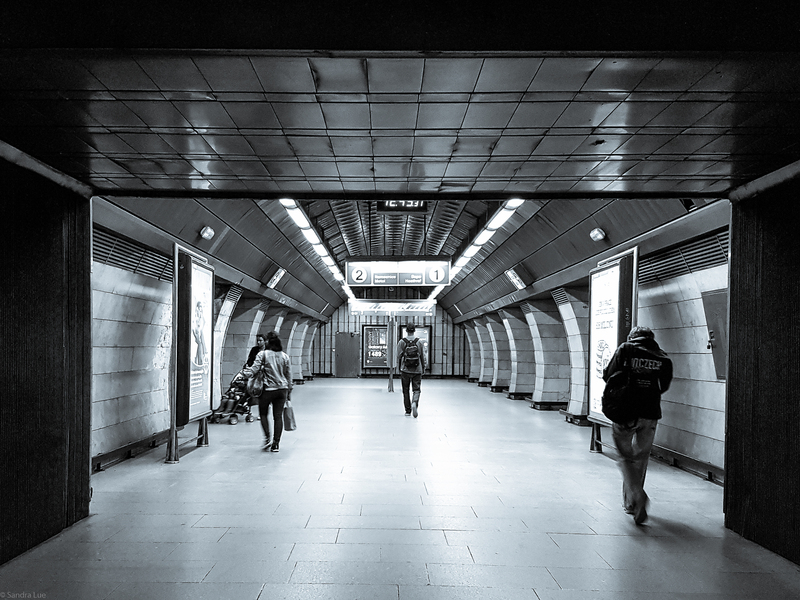 For the the CB&W challenge, I show two photos with vanishing point perspectives. And because I like them, I include two more with absolutely no point at all. Not on the ocean but a very different body of water. 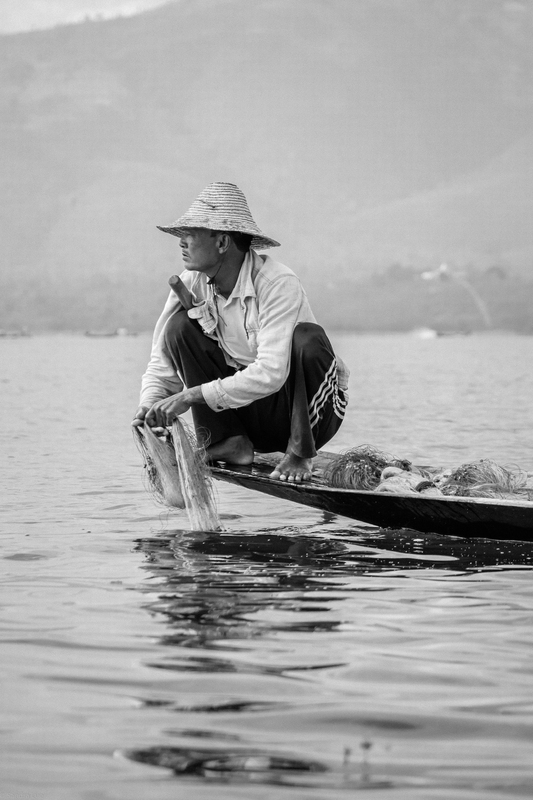 These photos were taken on Inle Lake in Myanmar and feature the fishermen of the area. There are two types of fisherman. Those who fish and those who pose for tourists. Both have remarkable agility and balance on their long boats. They move about the boat, casting and pulling in their nets while steering tall paddles with their feet. The difference between the fishers and posers? The posers are better dressed. This fellow is a fisherman. 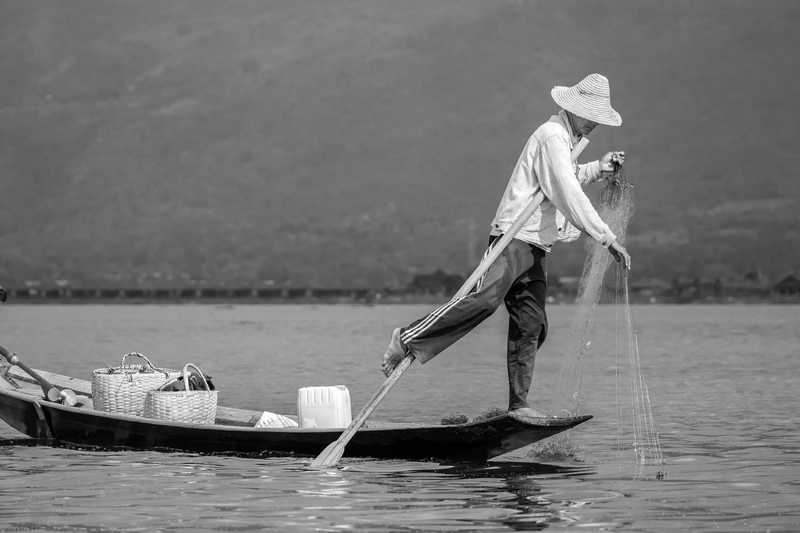 Photos taken on Inle Lake, Myanmar in 2016. Lately I’ve been spending too much time huddled over my phone, checking status, entering challenges, voting and topping up my exposures. I’ve been playing Gurushots, a real-time online photo competition system. It works by entering challenges and accumulating votes to achieve levels. The levels tip to points and the points tip to ranks. The more you vote, the more exposure your photo entries get for voting. There is no limit to the number of challenges you can enter. And that’s a problem. At one point I had ten challenges going. I was constantly checking on my exposure meter and submitting votes to bump it up. Problem is that voting involves paging through hundreds of photos, some good, some not so good and some downright puzzling. It all depends on the wording of the challenge. Sometimes, the guidance is too vague. Take for instance the “Starts with a K” challenge. The description was too vague. It should have qualified the language. I paged through hundreds thousands of Kittens, Keys and Kiwis. (Question: How many interesting angles are there to a Kiwi? Answer: None. I’ve seen them all.) But then I started seeing Cakes, Coffee and Corn. Someone couldn’t spell. Wait … maybe they could spell but it was in German. Kuchen, Kaffee and Korn. Another fun challenge was “Face in the Crowd”. There were lots of pictures of crowds but no distinctive single face. Other pictures were classic single person portraits; you had to imagine the crowd. One remarkable shot was taken on stage, of the back of a band performing to a crowd. No faces seen but they were facing the crowd. Ha ha! That one got my vote. Anyways here are a few of my photos in recent Gurushot challenges. The legend of Halong Bay is that a celestial dragon defended ancient Vietnam by breathing fire on pirate invaders and spitting out hundreds of hot emerald stones into the north sea. The gems become islands which formed an impenetrable wall to other invaders. Today Halong Bay protected from the sea but vulnerable to a daily invasion of tourists. It is a busy thoroughfare of sailing boats and day cruise ships. By day the bay is alive with the sights and sounds of 8200 visitors daily. Select cruises offer overnight stays and in the late evenings and early morning it’s possible to experience the quiet solitude of the bay. On this morning I was awake at dawn. The early morning light had just broken and the only sound was the gentle slap of water against the fisherman’s oar. It was a quiet awakening to a brand new day. No need to say how this guy feels. Taken in Saigon’s Flower Market. It explains the bundles accumulating on his lap. In the East there is an ancient man made reservoir called Srah Srang. It was built in the 10th century by the Khmer civilization in the kingdom of Angkor. For over a thousand years people have used this place for religious rituals, communal baths and water collection. On this early morning, as dawn broke across a cloudy eastern sky, a lady collects water for another day. In the West coast of Canada, the rain forests meet the Pacific and the sun sets in a blaze of glory. A hoodie shrouded man walks along a jetty after bidding the day good bye. Two worlds. One day. Twelve thousand kilometers apart. The sun rises and sets on both. In Times Square, which isn’t square at all. Have you ever had that feeling? Like you’re in a place where you’ve never been but it feels like you’ve been there many times before? Like you’re walking and standing still at the same time? New York City, USA. March 2018. Have you ever had a photo that frustrated you with its lost potential? A picture where the image captured wasn’t the one you saw? This photo (the one below) is one of mine. It’s too far, too bright and too exposed. It doesn’t capture the muffled sound of the surf or the silent flight of sea birds. It doesn’t hint at the rough texture of the sand or the whisper of salt in the breeze. It doesn’t show the serene splendor of the Pacific Rim. I was ready to launch this in to the trash heap but then thought what if. What if this wasn’t a photo. What if it is was just a picture, a rendered line drawing that captured the highlights and textures. A digital editor could do that. And so there it is. My featured photo and reclamation of a lost shot. It is not a great photo. But it’s a not bad picture either, eh? This week’s Photo Challenge is Transient. lasting only for a short time; impermanent. 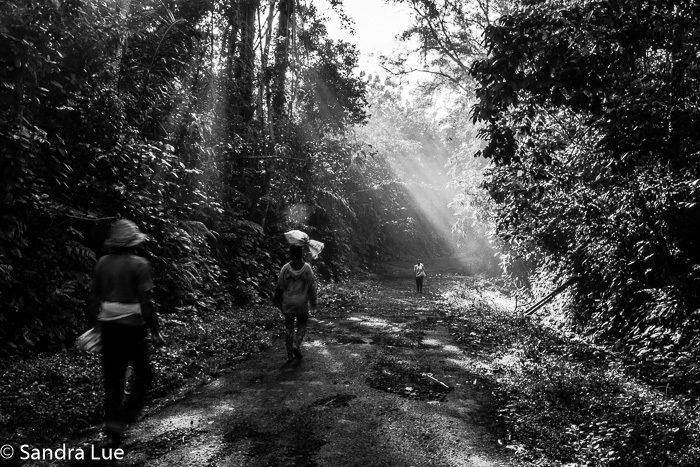 Photo taken in the hills around Ubud in Bali, Indonesia.